I am happy to announce we have a winner from the Blade Show raffle! Matthew Sessions is winning a Baby Eagle with a new version leather sheath. These are not yet available to all and I may tweak sheath design some once I put it for sale. This is a very nice design coming from my sheath designer that can be worn vertical or horizontal. I currently only have a few for testing purposes coming this week. 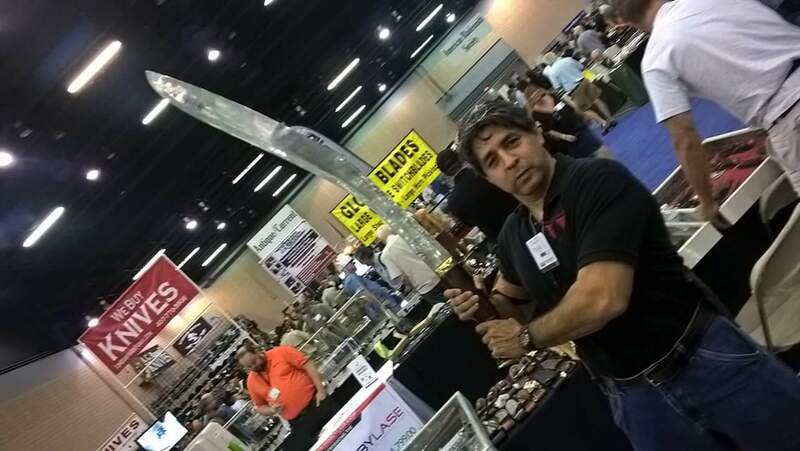 I am back from the Blade Show and enjoyed my time there. I got to meet many and was greet with much attention at the show. I took some photos along the way if you didn’t get a chance to come see me and my products. Allen Key holding my giant Khukuri. They used it in the photo shoot for television add as a prop. Allen requested to use it. Allen walked out with one of my Panawal Dotted knives. Allen Won season one of Alone where he lived in the wild for 50 plus days. I think 54. Ethan Becker showing off one of my knives to his entourage. Ethan owns Becker knives (BK knives) and special ordered a knife from me still to be made. David Shun picture. He was with Ethan. I am told he is owner of Shun knives. He wants one of my knives. 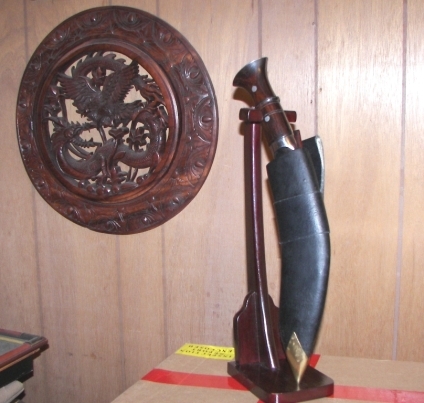 Sold the large giant khukuri used in the photo shoot. Sad to see it go, but it gives me the chance to make a better one. Ryu Li (tv show forged in fire winner). He wants to custom order a khukuri through me. Contest is closed. Thanks to all for participating and a very special thanks to Janiece D. for winning! Go to our Facebook, scroll to the post in our feed with the picture above and click Like and Share. Go to our Subscribe page and sign yourself up to keep up with us. Go to our Facebook, scroll to the post in our feed with the picture above. At this point you can comment 'In' to be entered once into the contest OR tag a friends name in the comments for 1 additional entry, tag 2 friends for 2 additional entries, tag 3 friends for 3 additional entries, etc. How many entries can you get? It's up to you! Wait for your name to be announced on 6-8-17 via Facebook or the Newsletter! If you don't like Knivesbyhand on Facebook by now you should just so you do not miss your name being called. Did you know I am making big moves? I am trying to clear out many older version knives on the Discount Knives Page Here. I am also been posting newer styles here recently. I hope you are following me on Facebook as I am getting in the swing of things and see some momentum coming. I really appreciate everyone enjoying a hobby that I turned into something I love.